In my work as a pastor, I hear these kinds of questions a lot. And in some of the situations where I sit with people in their pain, offering simply presence and prayer, I have to admit that I’m asking the same questions. Our souls ache when God seems far off, when doubt crowds in and faith flickers. However: our inability to hear or feel God is not an accurate indicator of God’s activity in our lives. Here’s what I know: sometimes, God works in ways we cannot see or feel, in our limited capacity. God sees, hears, and works, friend–even if you can’t quite see it yet. Even if all seems dry and lifeless. As the Ignatian prayer of Pierre Teilhard de Chardin reminds us, we can Trust in the slow work of God. I was reminded of this truth this week as I walked around my yard. 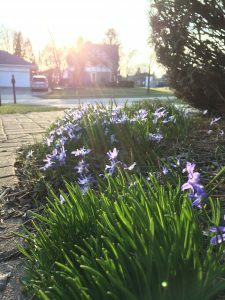 It is spring in the Midwest, which is to say one day it is snowing sideways and the next it is 50 and sunny and feels to our winter-weary souls like the tropics. 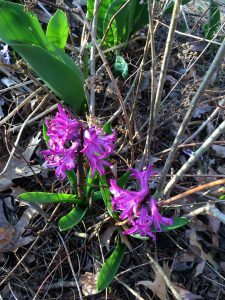 In spite of the lateness of spring this year, my yard is full of stubborn, sturdy flowers. 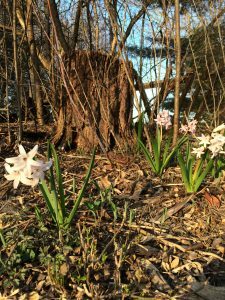 Crocus, scilla, hyacinths, daffodils come up, even among the dry sticks and leafless branches. Bursts of color delight among the drab vestiges of winter. All of these flowers begin their lives as bulbs—wizened brown bits, reminiscent of dehydrated onions. In an autumn years ago, when my children were still small and underfoot, we planted bulbs. Digging holes, dropping in the small, seemingly lifeless orbs, covered in papery brown skins. 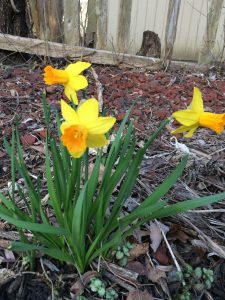 That spring, and every spring since, the bulbs shoot forth new life. Crocuses that often come up through the late spring snows. Scillia that have divided and spread and now line my front sidewalk. 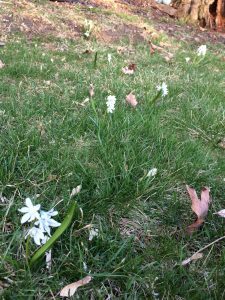 Flowers that sprout up in the middle of the lawn, where squirrels have buried stolen bulbs from the garden and forgotten them. Their inadvertent gardening means my lawn is scattered with blooms. Busy squirrels replant bulbs in the lawn. My point is this. In winter, I cannot see the slow work of the bulb, under the frozen ground and layers of snow and ice. It seems the bulb is silent. And yet—beauty comes. Every year. And the beauty will only come if the bulb gets cold, and experiences winter. And the flowers trust in the slow work of God. The miracle of new growth, of seasons. Spring will follow winter. The promise of beauty is not a promise that life will be easy and breezy. Sometimes the beauty God is crafting is in your character. The fruit of God’s Spirit looks like patience, kindness, goodness, gentleness, self-control. Patience, for example, grows in situations that test and try our patience, that would make us impatient, except that God is slowly transforming us. Sometimes we ask if God hears us, but what we need to ask is: do we hear God? Are we quiet enough to listen? God is at work. Trust that the beauty will come.